Every blanket tells a story, here are a few…. Life Story Blanket. This blanket is for my mom (in picture). We gave her a life story blanket for her birthday. She sleeps with it over her every night. Baby Story Blanket. This blanket was for a new baby boy. 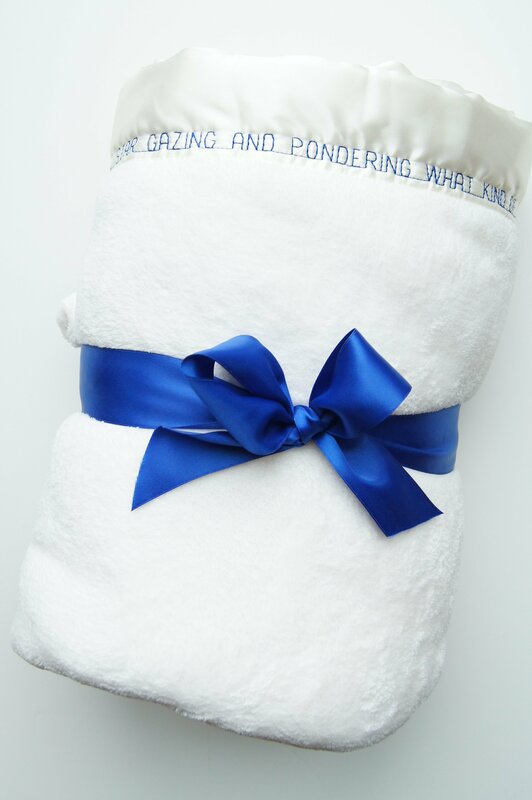 This was made for this “little prince” so that he may always feel the love and comfort of his family. Life Story Blanket. This blanket was given to this woman for her 50th birthday. Baby Story Blanket. 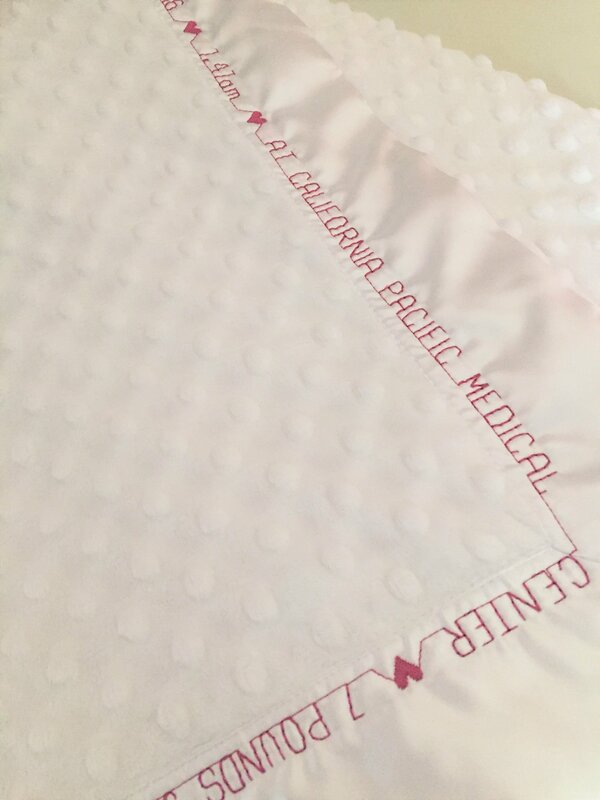 This new baby’s blanket includes a unique touch. This customer wanted to include her own special poem. 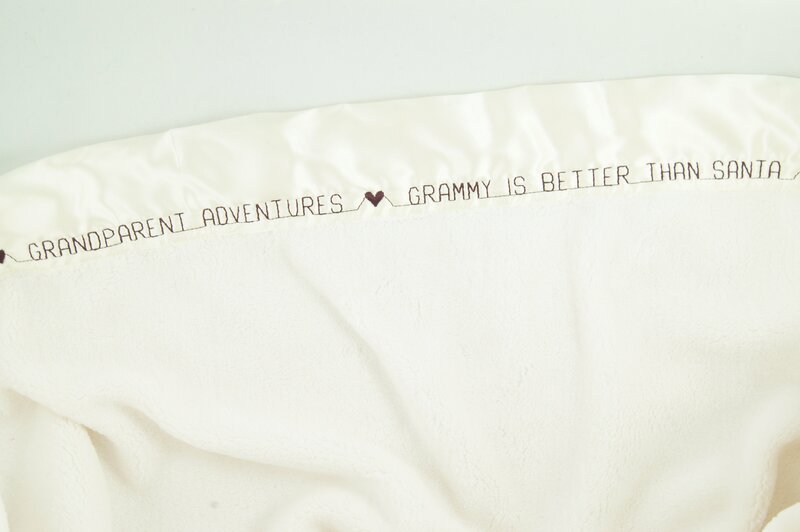 Her special words makes this blanket even more personal. A simple and beautiful symbol of warmth, comfort and security – with words that will be looked back on for years to come, as a reminder of just how much they are loved. 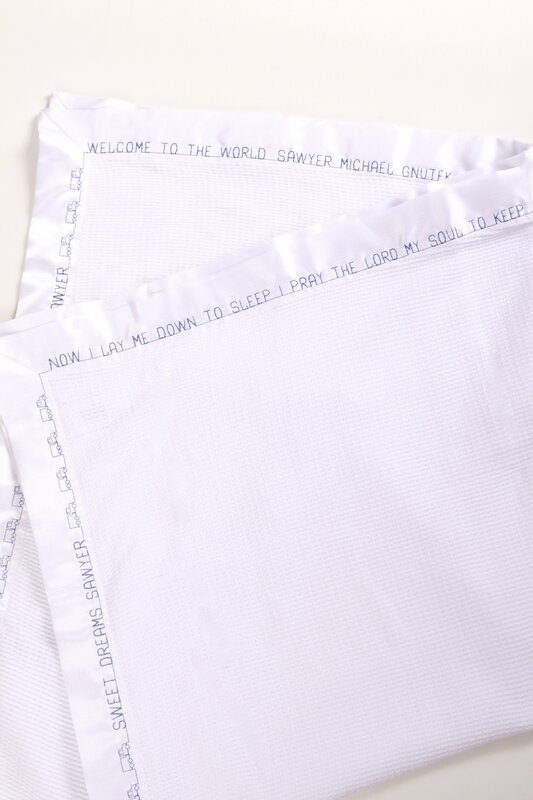 Baptism Blanket. This baby’s blanket was given for a special occasion. 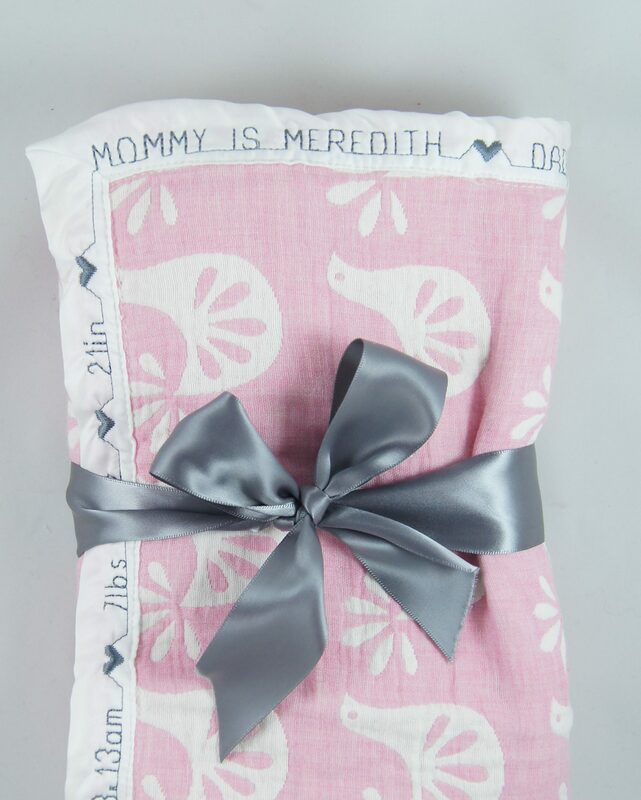 This baby girl received her little keepsake as a baptism blanket. It’s personalized with her baptism date, godparents, church, and a special bible verse. Baby Story Blanket. This blanket was made before this baby was born. Therefore, we did not have the birth stats. 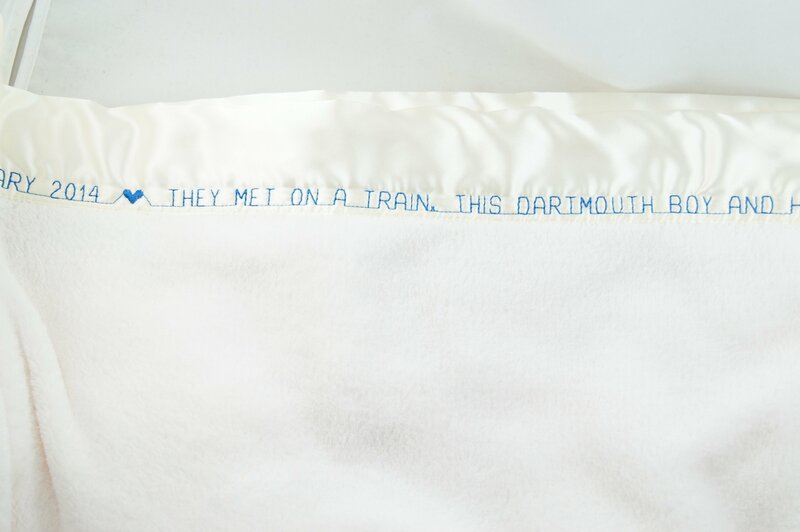 We embroidered a beautiful poem instead. Life Story Blanket. This was a 70th birthday story blanket for a very special mom. Care Blanket. 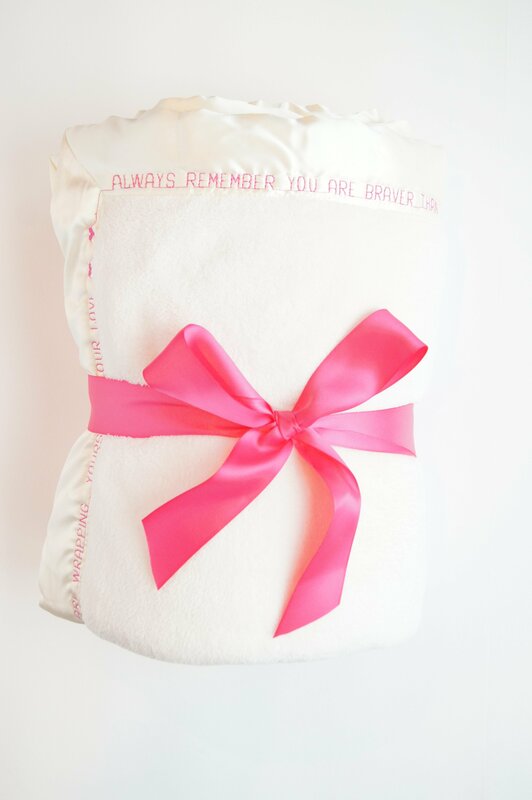 This throw size story blanket was given to provide comfort to a loved one going through the difficulties of chemotherapy. Her friends wanted to give her something special that would always remind her to keep the faith and be a constant reminder of how much they love her. Life Story Blanket. This blanket was given by a daughter to her mother. She wanted to give her mother something extra special for Mother’s Day. It was filled with all the things she loves about her mom. Life Story Blanket. This blanket was so fun! Two sisters took a trip together and at the end of their adventure one of the sisters wanted to give the other this blanket which had all their memories and fun times embroidered along the edges. She would always remember their special sisters trip. Life Story Blanket. One of our favorite dads/grandpas! We made this blanket for his 75th birthday. All of his children each listed one or more of their favorite memories about dad. I used something from every child and put together this story for his special story blanket. Life Story Blanket. 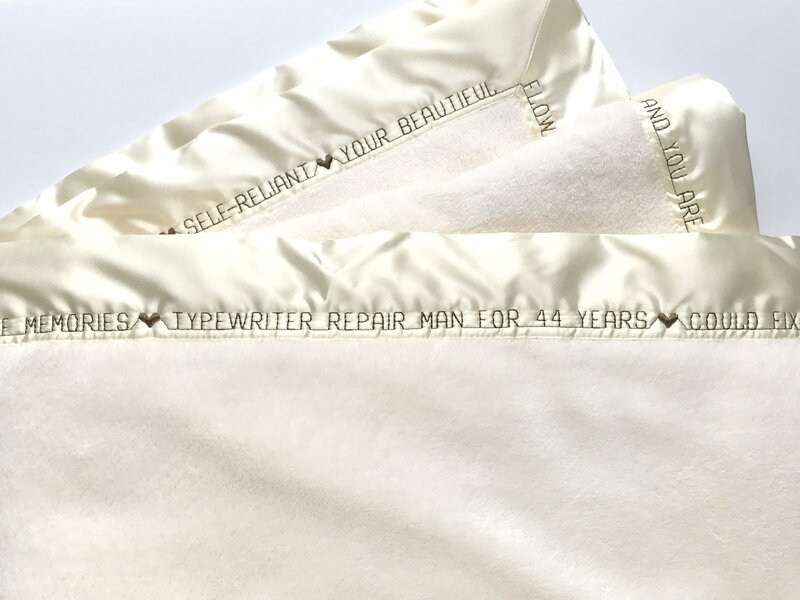 This special life story blanket was an 80th birthday gift to this woman. It’s filled with favorite memories from all her children, their spouses, and her grandchildren. Clearly, her reaction says it all! Baby Story Blanket. This baby’s boy blanket is filled with love. He will always be surrounded by “listening hearts and nurturing hands” and never forget the love that is all around him. Care Blanket. This was a blanket that a daughter made for her mother. Her mother was fighting cancer and her daughter wanted to do something for her. She made this blanket filled with their favorite memories and the mother used it to keep her warm during chemo treatments. She was always reminded of the love that surrounded her during those difficult times. Life Story Blanket. This father wanted to make a special blanket for his daughter, Reverend Shannon, who was leaving for El Salvador for a one year mission. He filled it with her favorite scriptures to remind her that her family loves her and is always with her, no matter how far apart they may be. Love Story Blanket. This special blanket was given to Alex and Crystal as a wedding gift. It is totally personalized with things about their first date, where they met, things they like to do together, proposal date, marriage date, and more. It’s their own love story that they can wrap themselves up in. EVERY LOVE STORY IS BEAUTIFUL, BUT OURS IS MY FAVORITE ❤ ALEX & CRYSTAL MET AT ARIZONA STATE UNIVERSITY ❤ OUR FIRST DATE WAS APRIL FOOLS DAY, 2010 ❤ SOME THINGS THAT MAKE OUR RELATIONSHIP SPECIAL ARE WE LOVE COORDINATING OUR HALLOWEEN COSTUMES AND GOING TO THE BEACH TOGETHER ❤ ALTHOUGH WE’VE BEEN TOGETHER FOR SEVEN YEARS, WE ARE SO OBSESSED WITH EACH OTHER THAT PEOPLE THINK WE ARE ONLY SEVEN MONTHS INTO OUR RELATIONSHIP ❤ CRYSTAL PROPOSED DECEMBER 26, 2015 ON CAMELBACK MOUNTAIN IN PHOENIX, AZ ❤ WE MARRIED JULY 29, 2017 AT THE SOUTH SHORE CULTURAL CENTER IN CHICAGO, IL ❤ HERE’S TO LOVE AND LAUGHTER AND HAPPILY EVER AFTER. Love Story Blanket. This love story blanket was given to Matt and Carli as a wedding gift. It’s their unique story of how they met and fell in love and has one of my favorite bible passages, 1 John 4:19. Confirmation Blanket. 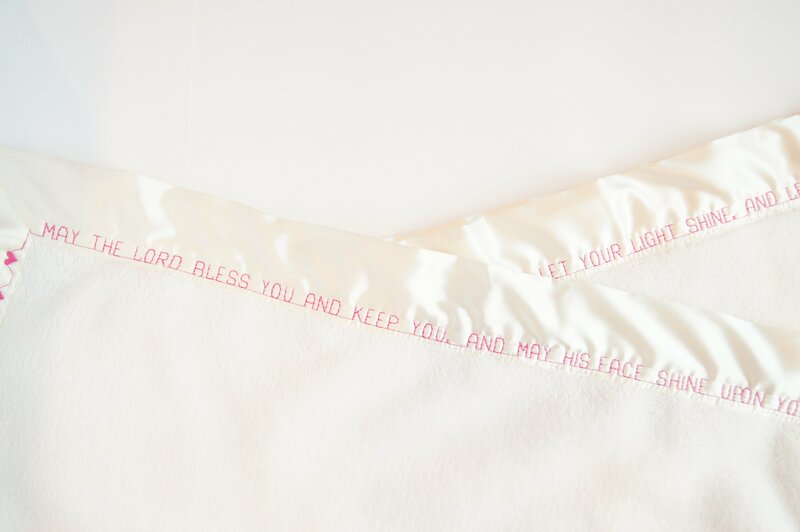 This was a blanket given to a young woman making her confirmation. This special memento will always remind her of her faith and commitment to God. Memorial Blanket. This life story blanket was one of the most special blankets I have had the honor to make. A family had recently lost a loved one. The mother wanted to make this blanket for her daughter so that she would always remember her father. This blanket contains all their favorite memories and things about her dad. Every time she wraps herself up, may she remember the love and comfort of her father. Life Story Blanket. This blanket was very unique! These parents gave their daughter who is an actress this life story blanket that was filled with all the names of every play she has ever been in. Life Story Blanket. This blanket was a group project. Seven siblings all came together and collaborated on this blanket to give to their mother for her 80th birthday. We worked together and put all their favorite memories and loving thoughts on this blanket. Love Story Blanket. Talk about being at the right place at the right time…This happy couple met on a train! This blanket was given to them as a wedding present and holds all their precious memories and big moments in their relationship. ❤ FEBRUARY 2014 ❤ THEY MET ON A TRAIN, THIS DARTMOUTH BOY AND HIS WELLESLEY GIRL, DISCUSSED PARIS, FOOD, AND THE FRENCH WORLD ❤ CHARLOTTE AND JASON, ORIGINALLY BOUND FOR NEW YORK AND NEW CANAAN, ADVENTURED WEST TO SAN FRANCISCO WHERE ROMANCE BLOSSOMED INTO AN ENGAGEMENT ❤ NOVEMBER 8, 2017 ❤ FOLLOWING A MAGICAL WEDDING AT MEADOWOOD, NAPA VALLEY ❤ AUGUST 18, 2108 ❤ THEIR JOURNEY BEGAN AS MR. AND MRS. JASON VICTOR ❤ WHAT A WONDERFUL WORLD! ❤ WE LOVE YOU BOTH WITH ALL OUR HEARTS AND WISH YOU AN ETERNITY OF HAPPINESS OFF THE CHARTS! ❤ VICTORIA, WILSON, CAROLINA, AND HENRY ❤ HERE’S TO LOVE AND LAUGHTER AND HAPPILY EVER AFTER ❤ TOUJOURS L’AMOUR!